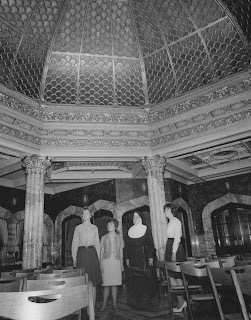 the Pompeian Room of the Doheny Mansion, 1962. STATELY BUILDINGS ARE, FRANKLY, A DIME A DOZEN even on utilitarian college campuses. But there is stately, and then there is spectacular. Yesterday (Aug. 16) was the Convocation of the College, and high on the agenda was marking the 50th Anniversary of the Doheny Campus. Our colleagues in Student Affairs put together a slideshow of historic photos -- many from the College Archives -- pairing a shot from 1962 with the same view today. The photo that got the most oohs and ahhs was the one above, which shows some of the inaugural class of Downtown Campus coeds crammed into the Pompeian Room in the Doheny Mansion. Amid the Moorish-Gothic Roman-Tiffany fantasy in marble is a prosaic blackboard and bubble-hairdo'd students on folding chairs. The lecture is on the drafting of the U.S. Constitution. ...perhaps the most spectacular room in Los Angeles -- a breathtaking spectacle of gold, marble and colored glass, accented with bursts of Pompeian Red. A triumph of Beaux-Arts splendor, the Pompeian Room is a Mediterranean vision built in Los Angeles, the Rome of the American West. The Pompeian Room was not original to the Doheny Mansion, built by the Posey family in 1899 and purchased by Edward L. and Estelle Doheny in 1901. It replaced a patio and was inspired by a lavish hotel ballroom the Dohenys visited in Chicago. 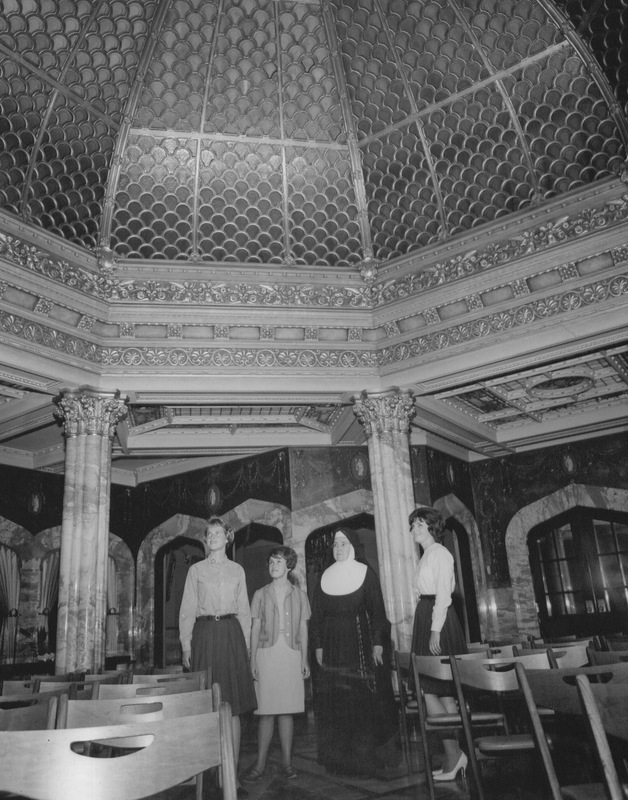 It hosted many a prominent businessman, foreign dignitary or church official among the Doheny coterie, who dined on a mirrored table beneath the famous gold glass dome. students survey their ornate new classroom. The Sisters of St. Joseph of Carondelet were less interested in their spectacular new surroundings than they were in getting the Downtown Campus up and running quickly in the fall of 1962. The Pompeian wasn't the only grand salon to see the sudden influx of desks and blackboards -- classes were also held in Nos. 7 and 10, and No. 2 served as the library. 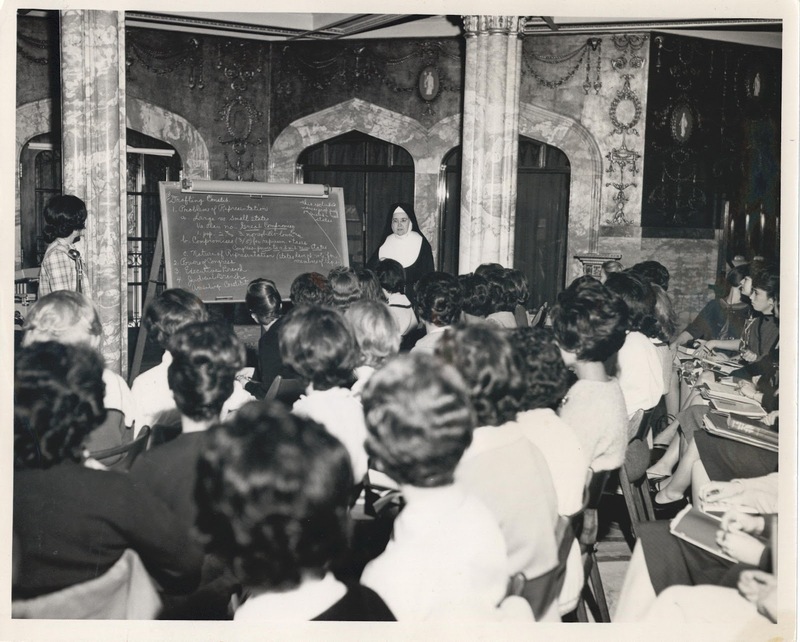 It's not known how long classes continued in the Pompeian Room, but one of the first additions to the Doheny Campus was the Classroom Building in 1965. That would suggest that students met in these rooms for at least three years before moving into modern quarters. One has to wonder what a distraction that golden dome would have presented, at least for the first few class meetings. Did students get stiff necks staring at the ceiling? One of the reasons for the oohs and aahs at Convocation, perhaps, is the Pompeian Room's current holy-of-holies status; most Mount students will graduate without ever seeing it. That is, unless they catch it in a movie like The Princess Diaries or one of the many films and TV shows that have been shot on location there. Next month after the annual Mass of the Holy Spirit, the Doheny celebration will continue with tours of the Doheny Mansion. We're hoping lots of students will take advantage of them and get a firsthand look at their Pompeian treasure. And they won't be distracted by a U.S. government lecture.